StFX is pleased to welcome two new Canada Research Chairs to campus, Dr. Laura Estill, a Canada Research Chair (Tier 2) in Digital Humanities and New Media; and Dr. Katie Aubrecht, a Canada Research Chair (Tier 2) in Health Equity and Social Justice. Both Dr. Aubrecht and Dr. Estill will each receive $500,000 over five years in funding from the Government of Canada, as well as a $20,000 per year research stipend as part of these Chairs. The Honourable Kirsty Duncan, Minister of Science and Sport, announced these investments on Nov. 13, on behalf of the Canada Research Chairs Program (CRCP). StFX held a special announcement celebration on Nov. 30 with Central Nova MP Sean Fraser in attendance. “It’s exciting to be here,” Mr. Fraser said as he noted to the crowd gathered that we’re here to celebrate these two new incredible talents to campus. 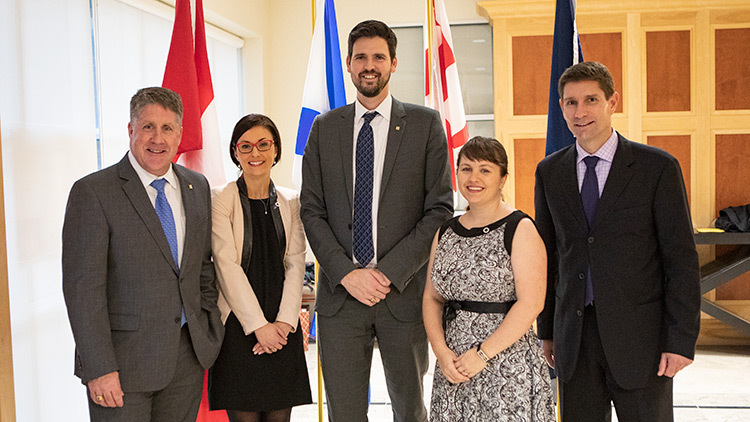 “These CRC chairs have already made impressive contributions,” StFX President Dr. Kent MacDonald said as he welcomed Dr. Aubrecht and Dr. Estill to StFX and thanked the Government of Canada for its tremendous support in helping make this happen. The Canada Research Chair program is so important, he said, as it helps complement the faculty at StFX and continues to support the research contributions made in the community. “We are fortunate to have attracted Dr. Aubrecht and Dr. Estill, two exceptionally talented early career scholars to StFX as Canada Research Chairs. Together, they considerably strengthen the depth of StFX research expertise in health equity and digital humanities fields,” says Dr. Richard Isnor, StFX Associate Vice President, Research and Graduate Studies. “We are delighted that they have been successful in their Canada Foundation for Innovation (CFI) applications to establish new laboratories for social sciences and humanities research. Dr. Aubrecht will establish the Intersectional Disability Studies Research Lab for work on policies and practices that will enhance the quality of mental health care for diverse populations living in Atlantic Canada’s rural communities. Dr. Estill will establish the StFX Digital Humanities Research Centre to advance pedagogical research in the digital humanities, as well as facilitate collaborative research with scholars across Canada and internationally. Bios of each new Canada Research Chair follow below. Dr. Laura Estill is a newly appointed CRC in Digital Humanities and New Media in the Department of English, Faculty of Arts at StFX. Dr. Estill is an exceptional emerging scholar in this area. She holds a PhD in English from Wayne State University (awarded in 2010), an MA in English from the University of Toronto (2005), and a BA (honours with distinction) in drama and English from the University of Windsor (2004). Prior to her current appointment, she held a tenured academic position as associate professor of English at Texas A&M University, College Station where she was awarded a Texas A&M University College of Liberal Arts Rothrock Fellowship. She has received a Renaissance Society of America Research Fellowship held at the Bodleian Library, University of Oxford; a Texas A&M University Arts & Humanities Fellowship; and a Banting Postdoctoral Fellowship, which she held at the University of Victoria’s Electronic Textual Cultures Lab. Dr. Estill has been a Visiting Scholar at the University of Massachusetts Center for Renaissance Studies and was awarded the Montague Teaching Award by the Center for Teaching Excellence at Texas A&M University. Dr. Estill’s research has been sponsored by multiple grants at the university, federal, and international level, including the Social Sciences and Humanities Research Council (SSHRC) in Canada and the National Endowment for the Humanities (NEH) and Folger Shakespeare Library in the United States. Dr. Estill has achieved international stature as a result of her position as editor of the World Shakespeare Bibliography (WSB) Online, a longstanding digital humanities project often called “invaluable” to Shakespeare studies. Her recent Shakespeare Quarterly article, co-written with Dominic Klyve and Kate Bridal, takes a cultural analytics approach to writing about Shakespeare (including translation, adaptation, scholarship) indexed in the WSB to gauge how Shakespeare was received from 1960-2010. The dataset for this article was published in the Journal of Open Humanities Data, opening the door for further quantitative research in this field. Her publications have appeared in journals such as Digital Humanities Quarterly, Digital Studies/Le champ numérique, Digital Literary Studies, Papers of the Bibliographical Society of America, Shakespeare, and Studies in English Literature. Her monograph, Dramatic Extracts in Seventeenth-Century English Manuscripts: Watching, Reading, Changing Plays appeared in 2015; in 2016, she edited Early Modern Studies after the Digital Turn with Diane Jakacki and Michael Ullyot. Dr. Estill has embraced a leadership role in fostering digital humanities and new media scholarship. She actively liaises with this emerging scholarly field, helping to build research networks and engaging in public humanities outreach. The nomination of Dr. Estill for this CRC will significantly enhance research strengths at StFX associated with this priority area of research. She will create new connections among StFX researchers working at the interface of humanities, digital technologies and media. Her research will contribute significantly to the development of pedagogy in this emerging area. Importantly, her vision is to create strong integration between undergraduate level teaching and research in the digital humanities locally, regionally and nationally, with the creation of a new national Canadian digital humanities research-based undergraduate certificate program (DHCanada), as well as addressing key gaps in digital humanities training and knowledge transmission in Atlantic Canada with the development of DHSI-East (Digital Humanities Summer Institute-East). These community-building projects fit strongly with the scholarly traditions of StFX. They align with the focus on remaining a primarily undergraduate liberal arts-based institution and they will result in tangible research deliverables, including the creation and dissemination of digital projects, journal articles, and an edited collection, Undergraduate Digital Humanities in Canada. DHCanada and DHSI-East will address gaps in undergraduate digital humanities training and foster student involvement in faculty research projects and original student research. Dr. Katie Aubrecht is a newly appointed CRC in Health Equity and Social Justice in the Department of Sociology, Faculty of Arts at StFX. Dr. Aubrecht is an exceptional emerging scholar in this area. Dr. Aubrecht is a disability studies scholar and health services and social policy researcher with a PhD in sociology of education (2012) from the University of Toronto (Department of Social Justice Education, Ontario Institute for Studies in Education). She holds a Master of Arts in sociology from York University, and a Bachelor of Arts (first class honours) in sociology from St. Francis Xavier University. Dr. Aubrecht’s interdisciplinary CRC research program aims to improve the quality of care and the self-perceived health of people living in rural communities within Nova Scotia who experience mental health and marginalization on the basis of disability, age, race, ethnicity, indigeneity, sexuality, and socio-economic status. The program examines marginality and mental health, rurality and resilience across the life span as health equity and social justice issues. The CRC builds on Dr. Aubrecht’s previous work on person- and family-centred mental and behavioural health care practices, programs and policies, conducted at the Nova Scotia Centre on Aging and Department of Family Studies and Gerontology, Mount Saint Vincent University from 2011-2018. This work was supported by external funding from two Canadian Institutes of Health Research (CIHR) postdoctoral fellowships (2013-16/2017-18), and a Maritime Strategy for Patient Oriented Research Postdoctoral Award (2017). It is also informed by Dr. Aubrecht’s graduate research on Canadian mental health policy funded by Social Sciences and Humanities Research Council of Canada (SSHRC) Canada Graduate Scholarships doctoral and master’s awards (2005/2007-2010). Dr. Aubrecht is actively engaged in multi-provincial equity-focused applied and arts-informed research programs; for example, as a research stream co-lead on the CIHR funded Seniors –Adding Life to Years (SALTY), which aims to improve quality in late life for people living in long-term care, their caregivers and the workers who support their care, and co-investigator on the Ontario-based SSHRC partnership project Bodies in Translation – Activist Art, Technology and Access to Life, which explores the relationship between cultivating activist art and achieving social and political justice. Dr. Aubrecht is a member of the inaugural cohort and network of CIHR Institute of Health Services and Policy Research Health System Impact Fellows. As a Fellow, from 2017-18 she worked with Nova Scotia Health Authority (NSHA) Continuing Care Program leaders and partners on a new model of care designed to support evidence-based high-quality person and family-centered care for older people living with chronic and complex care needs in rural and urban Nova Scotia. Her research has been published in Health, Culture and Society; Review of Disability Studies: An International Journal; Canadian Journal of Disability Studies; Studies in Social Justice; Social Identities: Journal for the Study of Race, Nation and Culture; Canadian Journal of Higher Education. As part of the CRC, Dr. Aubrecht has received funding from the Canadian Foundation for Innovation for her Spatializing Care: Intersectional Disability Studies Research Lab. The lab will establish a basis for intersectional disability studies research in Atlantic Canada, by developing a participatory arts-informed health research infrastructure at StFX that supports and enhances meaningful and ethical community engagement, and that connects and crosses disciplinary and sectoral boundaries, bridging medical, social and cultural approaches to mental health care.